You might not know how to play. But that shouldn't stop you from learning how to deal with cricket's most common problems. Like: what to do when a monkey keeps interrupting play. And who to bet on when you're watching a team of one-armed players take on a team of one-legged players. We've asked sportswriter Andrew Ward, author of Cricket's Strangest Matches, to give us a primer on what we need to know. Cricketers prefer not to share a field with the 6-leggers. While play has been stopped by flying ants, midges and wasps in the past, perhaps the biggest pests of all are the bees. During a match between Oxfordshire and Worcestershire in June 1962, the situation got so bad that players had to hide in the dressing-rooms until a beekeeper was summoned. But that's hardly the worst of it. In 1981, a cricket match in Bangalore was abandoned after thousands of bees--disturbed by children throwing stones--swarmed across the field and took revenge. Six players and an umpire needed hospital treatment! Bee attacks aren't just relegated to the past, though. Recently, during a test match between Sri Lanka and England in December 2007, swarms of bees flew across the Asgiriya Stadium field in Kandy. An experienced umpire set a good example by lying down on the floor. The players did likewise. Play was suspended for while everyone waited it out facedown on the pitch. Occasionally, cricketers have to deal with the business of monkey business. During a match in Poona, India, in December 1951, play was interrupted several times by a monkey running around the field. While Maharashtra were playing an England team, the monkey kept sneaking into fielding position close to the wicket. As the bowler ran in, the monkey watched with all the concentration of the fielders. Finally, a boy came on with a stick and chased the monkey away. And though he left his courtside seat, the monkey wasn't quite done. He climbed to the pavilion roof and watched the rest of the game from there. Cricketers know all about the bees, but they've had to educate themselves about working with birds as well. During a 1930s test match, a sparrow was struck by a fielder's throw. The crowd shouted for the poor bird to be put out of its misery, so a spectator ran on the field with that intention. He stopped down to kill the bird, but the sparrow flew off, sending the crowd into hysterics. Charity cricket matches are often contrived to be strange "“ Married v Single, Left-hand v Right-hand, Bearded Players v Shaven Players, Over-30 v Under-30, Smokers v Non-smokers, and so on. The most unusual of these matches took place in the 1850s and 1860s, where a team of one-legged players took on a team of one-armed players. The participants were usually veterans of the Crimean War, hoping to raise money for their own cause. Sideshows and family events enhanced the occasions. As for the most established contrived match, that had to be the annual fixture between Gentlemen and Players. The teams were selected from the best amateur players (the Gentlemen) and the best of those who earned their living from playing cricket (The Players). The first Gentlemen"“Players match was in 1806 and the last in 1962. The Gentlemen won 68 of the contests, Players 125, with 80 drawn and one tied. But the Gentlemen did not win any of the last eighteen matches. Bramble Bank, a sandbar in the middle of a stretch of water off the south coast of England, is a disaster area for shipping. But what's bad for industry is apparently great for cricket. Twice a year, for about an hour on each occasion, the sandbar surfaces as a temporary two-acre island. Despite the fact that pools of seawater cover the pitch, and players have to wear galoshes instead of their standard cricket boots, sportsmen take full advantage of the challenge: to play a cricket match during the hour when the island is available. Of course, the winning team is usually one of the local sailing clubs; generally the one that can get the most players to the shore. Similarly, Goodwin Sands is another target for hasty games. Most of the year the sandbar hovers dangerously just below the surface. But unlike Bramble Bank, Goodwin Sands has come dangerously close to causing a cricket catastrophe. 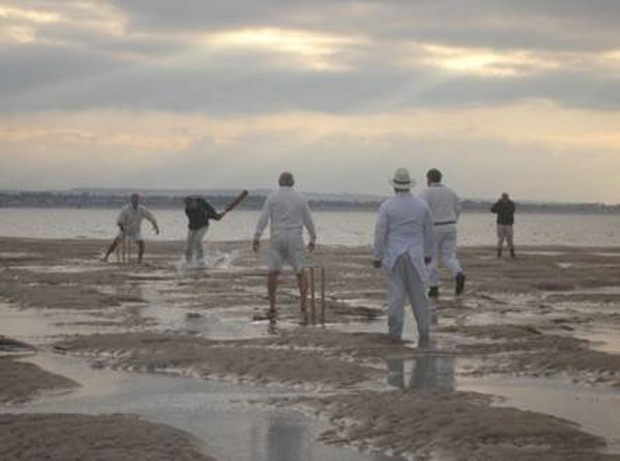 In November 2006 a BBC television team attempted to stage a Goodwin Sands cricket fixture. Unfortunately the escapade showed how easy it was to be caught by the rising tide. The television crew lost an estimated Â£100,000 worth of equipment and the cricket club lost equipment as lifeboats rescued stranded crew and players. In 2006, a Dutch team called the Fellowship of Fairly Odd Places CC played a game that took place in two countries. Half the field was in southern Holland and the other half was in Belgium. The international border ran across the wicket. Cricket matches have also taken place on a frozen Lake Geneva, an Icelandic glacier and a North American ice-hockey rink. Harry Thompson's book about a local cricket team's world tour, Penguins Stopped Play, featured an attempt to play in the Antarctic Circle. That was how the book got its title. The most common addendum to a cricket score in England is "Rain Stopped Play. " Occasionally the game continues in light rain, but cricket becomes a mockery if bowlers can't hold a wet ball or water is dripping off a cricketer's cap. Here are a few tips for dealing with Mother Nature. On one Saturday in May 1951 the east coast of Yorkshire was so foggy that many cricket games were affected. Captains couldn't see where their fielders were. The people keeping records of the match had to rely on relayed accounts from the players in order to keep the books straight. Just because your calendar says "summer," it doesn't mean Mother Nature's paying attention. In June 1975, a three-day match in Buxton, Derbyshire, missed an entire day's play because of a snowstorm. It was a game of three thirds. The first day Lancashire got a huge boost scoring 477 for five (declared) in excellent conditions. Then, there was no play on the second day because it was the snowiest summer day on record in England. On the third day, in dreadful batting conditions, Derbyshire scored 42 in their first innings and 87 in their second innings. Sometimes, the game just has to go on. In the Fenlands of East Anglia, during the 1870s, the frozen fields of winter were sometimes used for cricket. Fielders chased and slid across the ice, and batsmen often tipped over from the overbalance when taking too big a swing at the ball. It's also become traditional for certain local English cricket teams to play a match on Boxing Day (December 26) whatever the weather. Sometimes a matting wicket is laid on the top of snow or a muddy field. It is a real contrast to the Melbourne Cricket Ground, Australia, where Boxing Day Test matches usually begin in glorious summer sunshine. 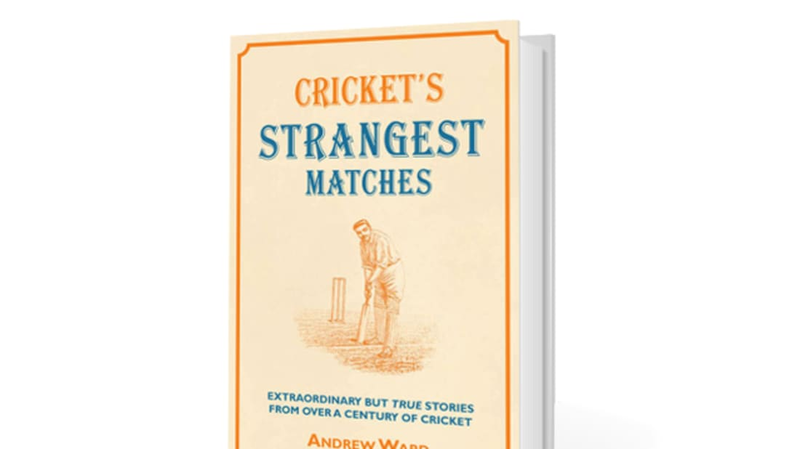 If you like this piece, be sure to pick up Andrew Ward's excellent book Cricket's Strangest Matches: Extraordinary but True Stories from 150 Years of Cricket here.